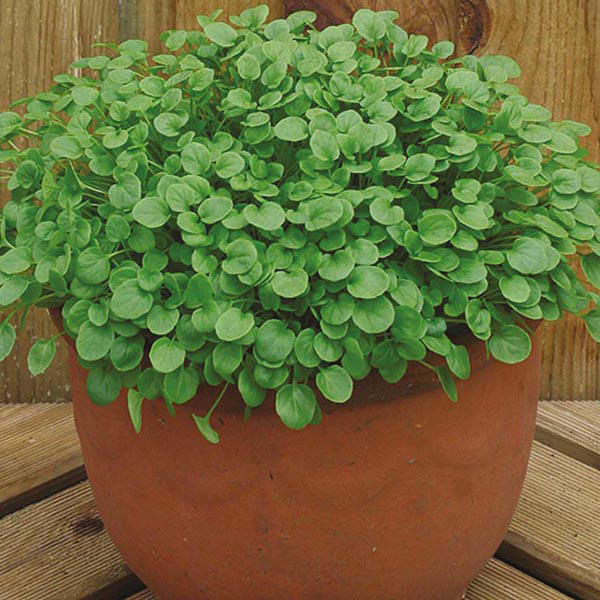 With a delicious peppery flavour, it's a great alternative to watercress. Easy and fast growing, it is quick to crop, even in containers. Outdoors: sow thinly March-September, where they are to crop, 1.5cm (½") deep, directly into prepared, fertile soil (with some shade), which has been watered. For cut and come again baby leaves, allow 15cm (6") between rows, or sow thinly, directly into 25cm (10") pots. Early sowings may benefit from cloche protection. Seedlings usually appear in 7-14 days. No further thinning should be necessary. Keep moist. Regular sowings, made every two to three weeks, will ensure a continuous supply of leaves. Pick a few from each plant when approx. 10cm (4") high. They will regrow for up to 4 'cuts.' For mature leaves, allow 25cm (10") between rows and thin to 20cm (8") apart. Harvest whole plants from May. Generally, the larger the leaf, the hotter it will become.